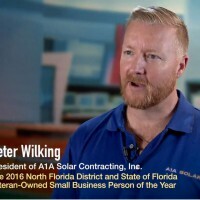 Pete Wilking is the owner and founder of A1A Solar Contracting, Inc. With a MBA and BS in Environmental Science, along with a strong background in engineering and finance, he saw an opportunity in the growing demand for solar power. After evaluating the market potential, Wilking started A1A Solar Contracting, Inc in 2010. The company designs and installs custom solar electric systems for the residential and commercial marketplaces. All work is done by company employees to ensure the highest quality system. This sets A1A Solar apart from many of its competitors who often use outsourced or contract workers, which can result in less control over quality. After learning about the Florida SBDC at the University of North Florida (UNF) in a MBA class in 1999, Wilking turned to the Florida SBDC at UNF in 2013 for help. He attended a workshop on how to do business with the government and also participated in the Florida SBDC at UNF’s CEO Xchange, a year-long program offering a peer-to-peer roundtable. He met monthly with other CEOs to share experiences, opportunities, and challenges of a growing business. In 2014, Florida SBDC at UNF consultants provided Pete with a complete Search Engine Optimization report to help him increase activity on his website. A1A Solar was also a “live case study” for a graduate class in the UNF Coggin College of Business. The student team developed a social media strategy for the company. Further, in 2016, the Florida SBDC at UNF provided Pete with an in-depth market research report on a potential new market. A1A Solar has experienced tremendous growth, particularly from 2012 to 2013, fueled in part by some rebates and tax incentives for energy, along with the launch of a comprehensive marketing campaign. The growth in sales required hiring more employees to meet the demand. Since 2012, the company has grown from eight to 48 employees. To accommodate this growth, A1A Solar received a SBA 504 loan and made a capital investment to purchase its office and warehouse in 2013. Pete, who served his country in the Persian Gulf War as a U.S. Navy Supply Corps Officer, runs A1A Solar as one would expect from a Navy veteran – like a ship. As a testament to his leadership, A1A Solar has received a number of accolades, including recognition by Solar Power World, the industry’s leading source for technology, development and installation news, on several occasions. A1A Solar has also been recognized as a leader in its local community, being recognized as the Green Business of the Year by the Amelia Island Chamber of Commerce in both 2013 and 2015, being recognized by the Jacksonville Business Journal as both a ‘Best Place to Work’ in Jacksonville and also one of the ‘Fast 50’ (fastest growing businesses in Jacksonville; all the while continually receiving accolades and overwhelmingly positive reviews from clients). In 2016, Pete was named the SBA North Florida District and State of Florida 2016 Veteran Small Business Owner of the Year. Recently, A1A Solar was selected to install the largest privately-owned rooftop solar array in Florida on top of Jacksonville’s new IKEA store. "As a business owner, one of the smartest things I’ve done has been to utilize the services of the Florida SBDC. I have been able to rely on the Florida SBDC’s Network and resources as well as Cathy Hagan’s knowledge and advice from the start. As my business has grown, our relationship has developed into a trusted friendship. I definitely would not be where I am today professionally if it were not for the SBDC, and I would absolutely recommend the SBDC to any entrepreneur or any small business that may be looking to grow." - Pete Wilking, President - A1A Solar Contracting, Inc.